"I make objects for the body, creating a place of mystery, dimension, fluidity and intrigue. I like to travel to and through my work and hope the things that interest me will interest and seduce the wearer/collector. I am attracted to the challenge of materials and processes to create work that investigates the body. My jewelry is influenced by history, my memory, experiences and environment. My environment is urban - in the city of glass and concrete I explore space, shadows and nature. I am an observer - walking and public transportation is my library. Through the structure of jewelry and adornment I want to tease our senses, create awareness of our bodies and encourage communication. " 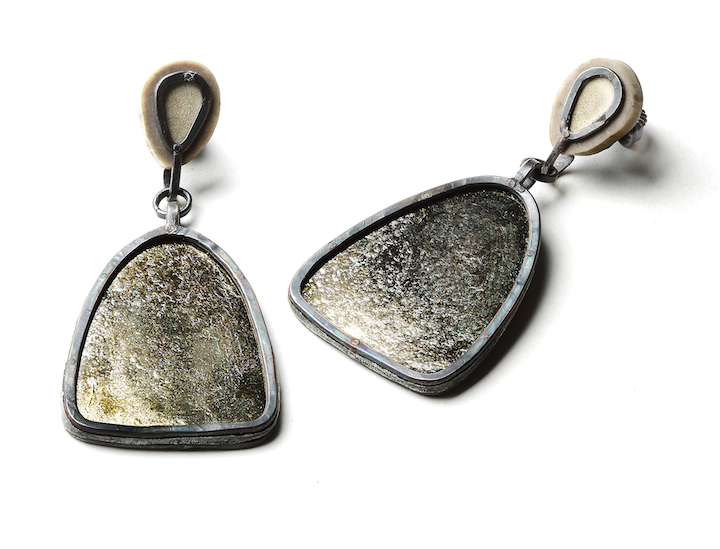 Trained as a graphic designer and printmaker, Biba Schutz has been a practicing, self-taught metal smith and jeweler for more than 20 years. Schutz’s works can be found in the permanent collections of the Racine Art Museum, Racine, WI, Renwick Gallery of the Smithsonian American Art Museum, Washington, DC, Corning Museum of Glass, Corning, NY, Museum Of Fine Arts, Boston, MA, among others. She has received the Award of Excellence from the American Craft Council in 2008, and her work has been exhibited internationally in solo and group shows. Schutz currently lives and works in New York City.